TOWIE‘s Chloe Sims and Dan Edgar were spotted smooching as a 2017 throwback video emerged just days after they went public with their relationship. Gemma Collins filmed the flirty duo locking lips during the Christmas Special party two years before they shared their romantic feelings for one another in Thailand. In the historic clip, the handsome Lothario wrapped his arms around his very close friend as they shared a raunchy kiss in front of their fellow TOWIE stars. It was a intense moment as Chloe leaned in for the kiss with her pal while Dan sat comfortably on a bar stool. Quickly the pair realised they had been rumbled as the GC captured the racy moment on her iPhone and shared it with her Instagram followers at the time. Dan pulled away from the kiss and he grinned cheekily at the camera when he peered over the top of Chloe’s shoulder. Just one day ago, Chloe confirmed she and Dan were ‘seeing how it goes’ after growing close to each other over their four years of friendship. The mother-of-one ruled out claims it was a holiday fling in Thailand because she insisted it was so important they do ‘not damage’ their friendship. She said: ‘The idea that it was a holiday fling in Thailand made it sound cheap! I am not a fling type of girl and I wouldn’t cry my eyes out about a fling. There’s a lot of mutual respect there. Things heated up between Chloe and Dan when they were away filming The Only Way Is Essex in Thailand which has now just aired on TV. The mother-of-one laid her cards on the table as she admitted she’d ‘marry him right now’ during their candid talk. 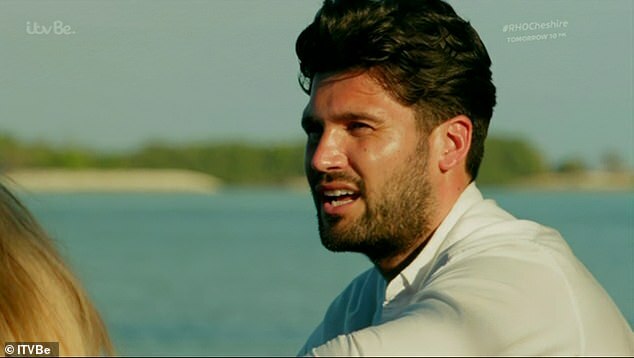 However, viewers were left doubting about Dan’s emotions for Chloe because he divulged he was weary over the ‘pressure’ of their relationship. The hunk revealed he also holds feelings for his love interest but confessed he’s worried about the pressure from their close friends. He shared: ‘I feel like there’s a load of pressure, that didn’t need to happen. I feel like I’m going to end up hurting someone… you know that I care about you a lot, but it’s been a lot to take in. Chloe didn’t hold back her fondness for Dan as she added: ‘Now I want [the relationship] more than I wanted it two days ago, I feel like you’ve started to pull away. ‘I’m on your side, and I’m not going to pressure you. I would be upset if we had to shut it down because of others. ‘I’d marry you right now. We’ve done everything how we’re supposed to. We should just carry on and not let any drama get in between us’, the mother-of-one added, before embracing Dan with a warm hug. In a cosy chat with MailOnline, Georgia Kousoulou dished her TOWIE co-stars Chloe and Dan had always been ‘very close friends’. She told us: ‘They’ve always been friends, very close friends. We are all close to the guys… It happened in Thailand.